Part of the essence of the post-totalitarian system is that it draws everyone into the sphere of power, not so they may realize themselves as human beings, but so they may surrender their human dignity in favour of the identity of the system, that is, so they may become agents of the system’s general automatism and servants of its self-determined goals, so they may participate in the common responsibility for it, so they may pulled into and ensnared by it, like Faust with Mephistopheles. More than this: so they may create through their involvement a general norm and, thus, bring pressure to bear on their fellow citizens. And further: so they may learn to be comfortable with their involvement, to identify with it as though it were something natural and inevitable and , ultimately, so they may – with no external urging – come to treat any non-involvement as an abnormality, as arrogance, as an attack on themselves, as a form of dropping out of society. 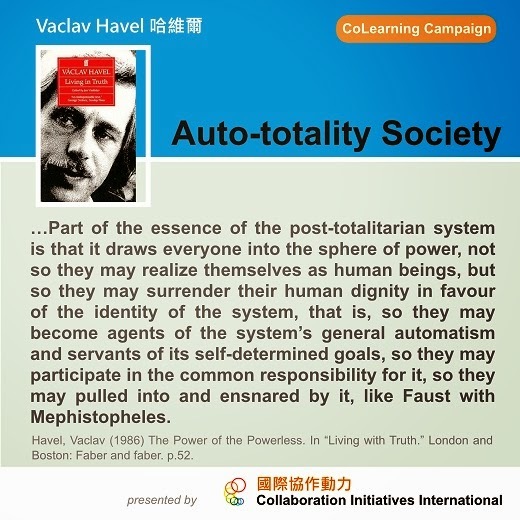 By pulling everyone into its power structure, the post-totalitarian system makes everyone instruments of a mutual totality, the auto-totality of society. Havel, Vaclav (1986) The Power of the Powerless. In “Living with Truth.” London and Boston: Faber and faber. p.52.